My former boyfriend (now hubby) during our courtship enchanted me my taking down these "one sheet" letterpress posters that the Cole Beatty Circus used to post on telephone poles and sides of buildings promoting their events when they came to Elmira. He loved them, and knew I would love them too. Love doesn't even begin to capture what I think of these posters. The clowns (huge) are positively terrifying with their big scary faces, raw line and simple color. Versus encouraging small children to come to see them, it absolutely frightens them away. A good place to put these posters might be over the mouseholes in our kitchens...They also had just typographic posters that they glued to the date of the month they would be in the specific town. Big Big numbers. Fab. Our hope was to collect 1-31 and frame them all and have them line a hallway. Then, they stopped doing this sort of thing. Shame. However, we now have BIG epson printers. Think of the opportunities. This might be an inspiration for a body of work or a thesis at Hartford. Hold that thought. 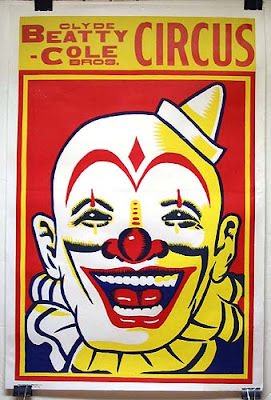 Comments: Bold American Circus "one-sheet" poster, marvelously primitive and dramatic artwork, woodblock printed in colors, an interesting example of American folk art that has survived well into the 20th century.